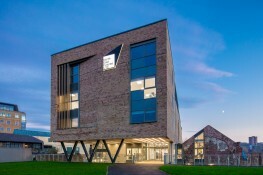 Optimised levels of natural light and ventilation have transformed a Grade II Listed Building that forms part of the £12m pioneering new University Technical College (UTC) in Newcastle upon Tyne. 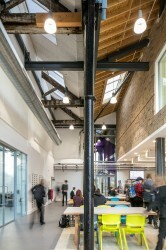 Located on the site of George Stephenson’s Locomotive yard, where the Rocket was built in 1829, the UTC incorporates both a new build element and renovation of the Hawthorn Engineering Works building. 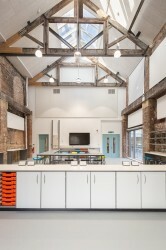 Xsite Architecture was tasked with constructing a four-and-a-half storey teaching block joined by a new link structure to the listed Hawthorn Engineering Works. 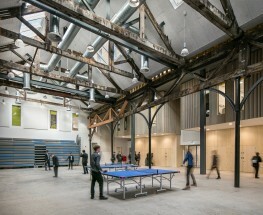 All three had to be redeveloped into a space that attracted students yet still satisfied Listed Buildings’ requirements, and maintained the feel of the industrial heritage of the site. The existing roof on the listed building, which had originally been fitted with basic linear slot glazing, had fallen into disrepair, so it was agreed that it should be replaced, while retaining as much of the original timber structure as possible. 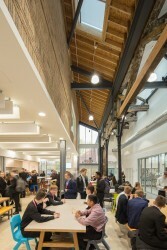 Maintaining the lines of the original rooflights would enhance the internal space, so the focus was on identifying a system that would sit harmoniously with the roof aesthetic of reclaimed slate and traditional lead work. The architects were also looking for a rooflight system that could be used as longlights on the new UTC building and linking structure. 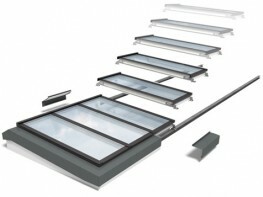 VELUX Modular Skylights were specified because they are fully pre-fabricated offsite, so can be installed up to 3 times faster than traditional rooflights. 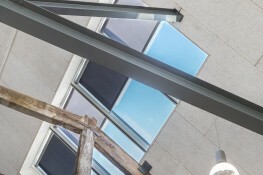 In addition, the architects and Listed Building Officer felt that the VELUX Ridgelights met the aesthetic requirements imposed on this refurbishment because they offer a classic, symmetrical looking solution that has superior slightlines compared to other systems and a tighter in-plane profile, meaning less outward projection from the roof. VELUX Northlights and Ridgelights were installed on the pitched roof of the grade II listed refurbishment. 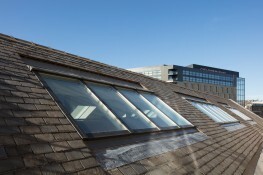 Two banks of 3 VELUX Longlights and one bank of 4 longlights, providing fixed and natural ventilation, were then installed on the flat roof of the main college building. These provide optimum levels of natural light and ventilation in the teaching laboratories below. Finally, additional banks of longlights were installed in the new link structure that connects the Hawthorn building and main college. 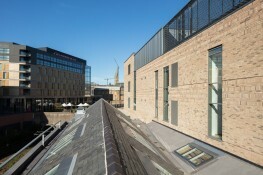 The Skylights were also supplied with factory fitted blinds to control glare, and are controlled with an open system solution that is connected to a building management network.